Khartoum / Nyala — The Sudanese security service arrested journalist Hussein Saad on Sunday while he was on his way home. A South Darfur journalist has been sentenced to prison under the emergency law, for unknown reasons. Colleagues of Hussein Saad told Radio Dabanga that the journalist, who is also active in reporting on the issues of Sudan's El Gezira and El Managil Agricultural Scheme farmers, was arrested while he used a taxi on his way home. He was intercepted by officers of the National Intelligence and Security Service (NISS) who took him to an unknown destination. On January 27, the NISS detained Iman Osman (editor-in-chief) and Tarig Ali (correspondent in Kosti) of El Midan newspaper. Journalists Adam Mahdi from Nyala, capital of South Darfur, and Musab Mohamed and Amin Sinada from Port Sudan were also detained. Journalists Gurashi Awad, Adil Kolor, Ageel Naeeim, Kamal Karrar, Omar Jumaa and Ismail Bilal are still being held by the security apparatus after they were also detained in December and January. 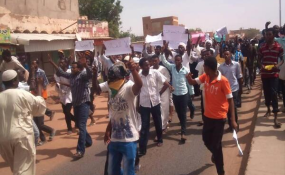 Sudanese media organisations and journalists have been targeted for reporting the events surrounding the demonstrations that have been going on for one and a half month, which call for the step-down of President Al Bashir and his regime that has been in power for 30 years. A court in Nyala, South Darfur, sentenced journalist Adam Mahdi to three months in prison under the state's emergency measures that have been installed against the backdrop of the demonstrations throughout Sudan. Salwa Yagoub, the wife of Adam Mahdi, said her husband had been transferred to Nyala prison and that she had not been allowed to visit him yet. "Until now I have not been made aware of the charges against my husband," she said. According to her sources, he was asked during his interrogation whether he was working as a reporter for a news website called Darfur 24. Mahdi is also an employee of the South Darfur Ministry of Culture and Information and was detained on 27 January, in front of the office of the official Sudan News Agency (Suna) in Nyala. His family has not been informed of the charges against him, nor has a lawyer been allowed to represent him. In January Sudanese authorities also withdrew work permits and press cards from journalists of Sudanese and foreign media agencies, including at the offices of Al Jazeera and El Arabiya TV Satellite channels in Khartoum, as well as correspondents of the Turkish Anadolu news agency.